When it comes to linking and seeing your company website on a Google SERP, you want everything to be perfect. Even the most obscure niches seem to have competition on the Internet, and SEO is one way to rise above that competition and earn visibility, new clicks and customers, and hopefully lead to sales. Building up a link portfolio is a great way to make this happen, and although Google is beginning to use other factors to analyze and rank websites, link building is still a strong strategy. There is one type of link, however, that often gets ignored to make room for a discussion about backlinks. These are known as “sitelinks” and they are not backlinks or on-page links at all. 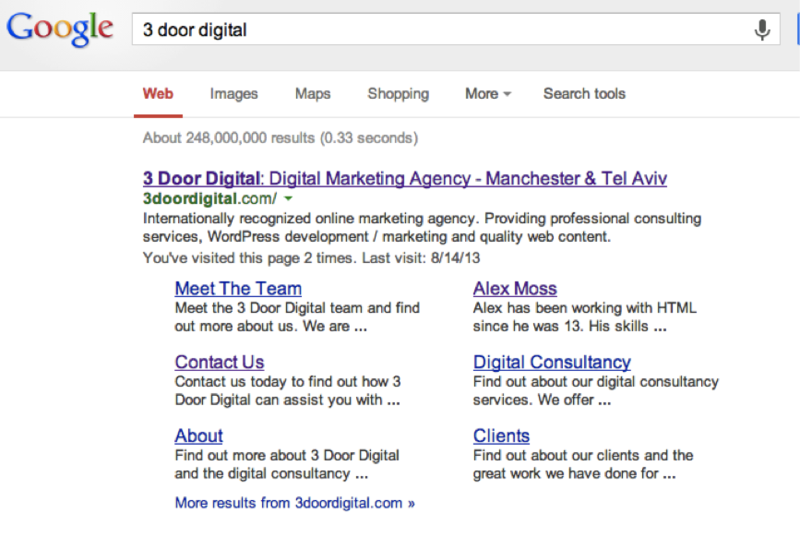 Sitelinks are the links that show on a Google SERP below a company name, and they are now more important than ever. Because 3 Door Digital is a company, that company is going to show up first. You can see that in this example the sitelinks are: Meet the Team, Contact Us, About, Alex Moss, Digital Consultancy, and Clients. These links tend to jump off the page and make it easier for users to navigate to a page on that company’s website, so they’re definitely seen as a positive. You will notice that not every single company has sitelinks on a results page. The reason for this is that it is up to Google whether or not you have sitelinks and up to Google which sitelinks users will see. It’s completely automated to try and determine which sitelinks users would benefit from most, in most cases meaning which pages are visited most. In other words, you really don’t have much control. Click on your site in GWT –> Search Appearance –> sitelinks –> for this search result –> type in URL of your company –> demote this sitelink URL –> type in the URL of the sitelink you want to demote. As a side note, it’s worth mentioning that this is typically called deep linking when referring to Bing (and sometimes this term is used when discussing Google), who just recently revised their deep link management features. According to a Slideshare presentation, PubCon New Orleans explained that when looking at the pages indexed to links ratio, 80-85 percent of the average ratio was sitelinks. Sitelinks cause your entry to appear bigger and therefore helps to generate clicks. People like to be able to get to where they are going quickly, and sitelinks make this happen. In the end, it’s really all about improving the visibility of your website. You want to stand out from the competition and look as professional as possible. Rich snippets can help you do this on a SERP as well as having an engaging Meta description, but your only other option is to utilize sitelinks. The sooner you can get started the better! Do you have any questions about sitelinks or any experience seeing success from using sitelinks? Let us know in the comment section below.